So it’s my 5 year anniversary of having this blog, which is kind of insane. I also just passed 200 posts. Quite an accomplishment considering I’ve slowed down with my baking. But it’s a big reason to celebrate, so we should dress up in our ugly holiday sweaters! Okay, there’s no way you’d call these ugly because they’re so precious! But they’re pretty tacky – I wouldn’t wear any of them… (Okay, maybe I would.) 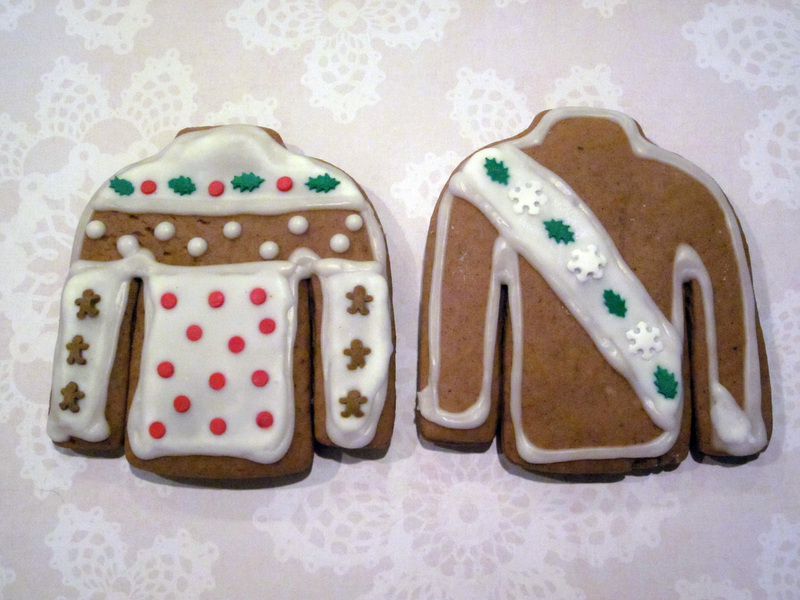 I was going to a holiday party and since my gingerbread men went over so well last year, the hostess requested I make them again, I figured I’d at least try a new spin on them. 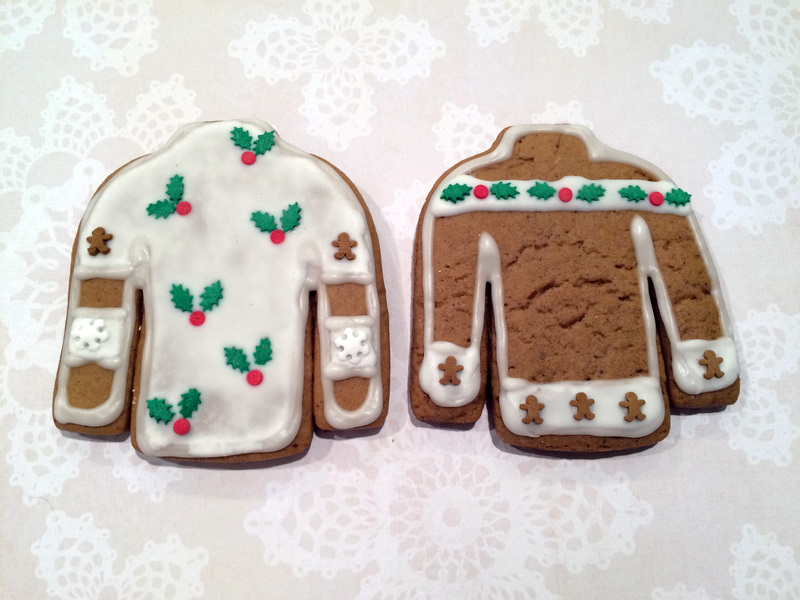 After decorating these dapper men last year, I decided to promote myself to clothing designer. 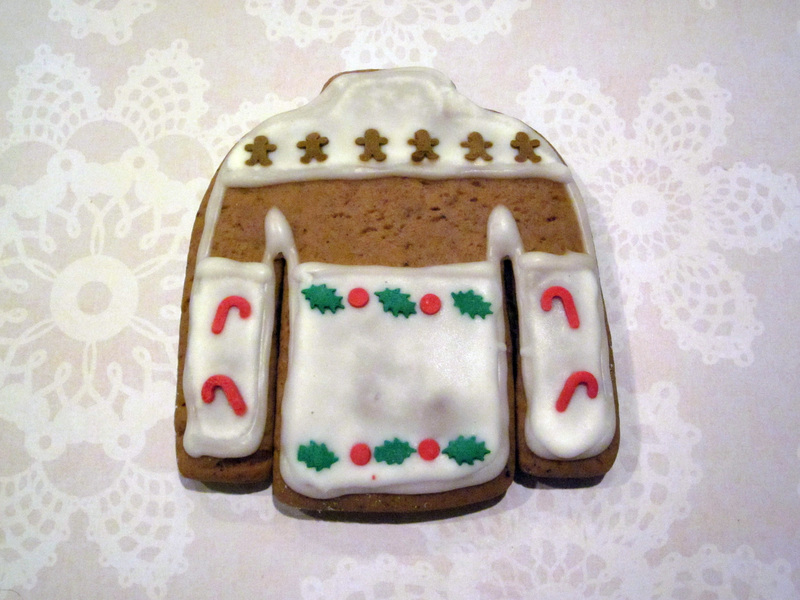 They sell these kits at World Market, and even just to get the cookie cutter it was worth it because I had a hard time finding a sweater-shaped one anywhere else. I stuck with white frosting for all of them not because I was taking a creative stand, but because the colored frosting I’d bought was not cooperating, and it wasn’t worth the fight. I made it through 3 green sweaters before giving up. But the sprinkles really pop against the white anyway, so I regret nothing. 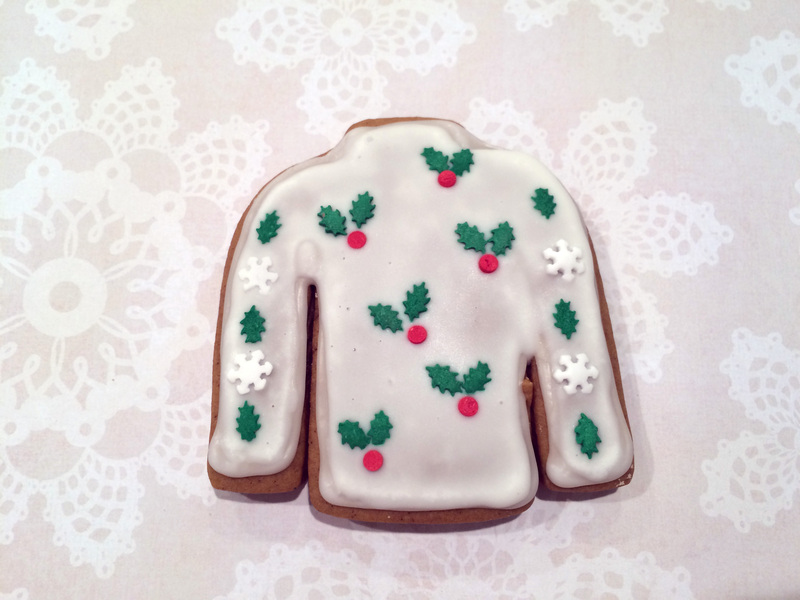 Some cookies had more frosted surfaces than others, partially because of my creative choices but also because I figure some people might not like it that much (like myself). Anyway, I tried to limit the pictures I’m posting, but it’s like picking a favorite child. I made each one completely unique, and it was a blast! These are always a crowd pleaser at parties, not just because they’re cute but they taste great! A few of the party guests told me they’d taken pictures of the cookies before eating them, and I heard one story of a girl who grabbed a bunch before she left so she could have them with her morning coffee. The host said he did the same thing with the few he stashed away as well. If you’re looking for a fun project, I highly suggest making some! (Warning, it’s probably a 2/3 day process. Baking one day (dough needs 3 hours to chill before baking), decorating another day or at least a couple hours later, and then it takes about a day for the icing to set, so you’ll want to leave time for that before boxing them up. Heed my warning! These are works of art! !